Is Public Storage (NYSE:PSA) A Good Stock To Buy After Narrower Q3 Loss? The fourth quarter was a rough one for most investors, as fears of a rising interest rate environment in the U.S, a trade war with China, and a more or less stagnant Europe, weighed heavily on the minds of investors. Both the S&P 500 and Russell 2000 sank as a result, with the Russell 2000, which is composed of smaller companies, being hit especially hard. This was primarily due to hedge funds, which are big supporters of small-cap stocks, pulling some of their capital out of the volatile markets during this time. Let’s look at how this market volatility affected the sentiment of hedge funds towards Public Storage (NYSE:PSA), and what that likely means for the prospects of the company and its stock. Is Public Storage (NYSE:PSA) an attractive investment right now? The best stock pickers are taking a bearish view. The number of long hedge fund positions fell by 2 in recent months. Still, that number was far from enough for the stock to be included in the list of 30 most popular stocks among ALL hedge funds. If you’d ask most market participants, hedge funds are seen as worthless, outdated financial tools of yesteryear. While there are over 8000 funds with their doors open at present, Our researchers hone in on the moguls of this group, about 700 funds. 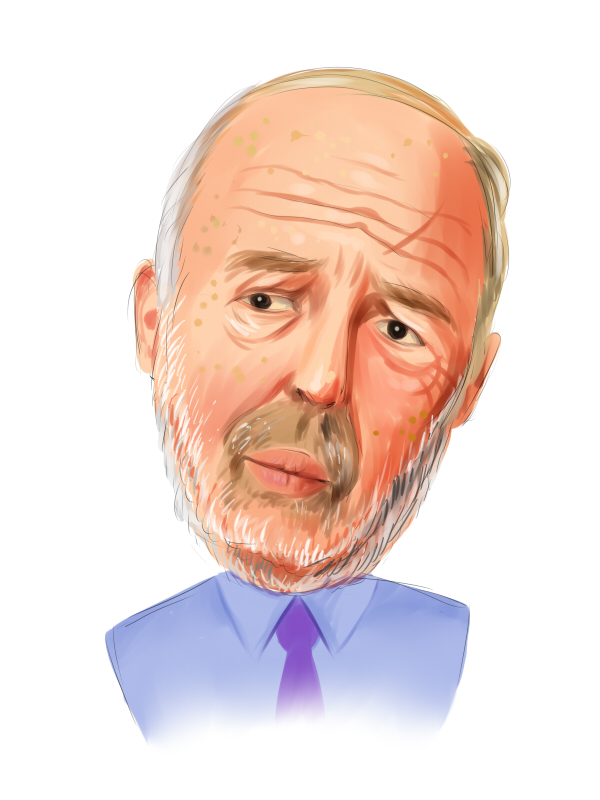 These hedge fund managers direct the majority of all hedge funds’ total capital, and by watching their first-class picks, Insider Monkey has discovered a number of investment strategies that have historically defeated the market. Insider Monkey’s flagship hedge fund strategy beat the S&P 500 index by 6 percentage points annually since its inception in May 2014 through early November 2018. We were able to generate large returns even by identifying short candidates. Our portfolio of short stocks lost 26.1% since February 2017 even though the market was up nearly 19% during the same period. We just shared a list of 11 short targets in our latest quarterly update. The Glendale, Calif.-based international self-storage company reported funds from operations of $2.66 per diluted common share for the three months ended Sept. 30, 2018, as compared to $2.35 in 2017, representing a 13.2% increase. Meanwhile, net income allocable to common shareholders was $322.7 million or $1.85 per diluted common share, compared to $279.7 million or $1.61 per diluted common share in 2017 representing an increase of $43.0 million or $0.24 per diluted common share. Board member P Ronald Spogli purchased 2,000 shares at $200.59 in August 2017. The shares are trading for $212.42 as of this writing, translating to a lucrative profit for Spogli. We’re going to analyze the new hedge fund action regarding Public Storage (NYSE:PSA). How have hedgies been trading Public Storage (NYSE:PSA)? At Q3’s end, a total of 15 of the hedge funds tracked by Insider Monkey held long positions in this stock, a change of -12% from one quarter earlier. 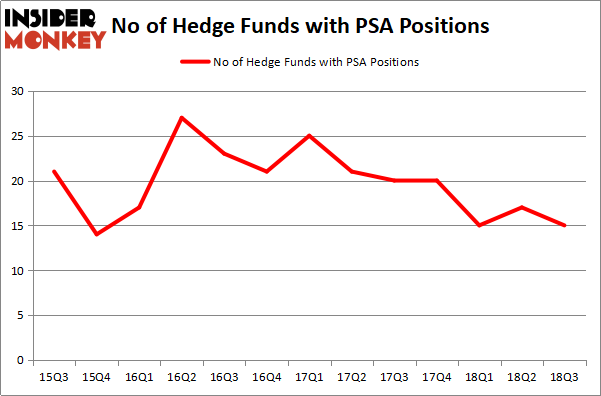 Below, you can check out the change in hedge fund sentiment towards PSA over the last 13 quarters. With the smart money’s positions undergoing their usual ebb and flow, there exists a select group of notable hedge fund managers who were upping their holdings substantially (or already accumulated large positions). More specifically, Renaissance Technologies was the largest shareholder of Public Storage (NYSE:PSA), with a stake worth $217.2 million reported as of the end of September. Trailing Renaissance Technologies was AQR Capital Management, which amassed a stake valued at $162.9 million. AEW Capital Management, Arrowstreet Capital, and Adage Capital Management were also very fond of the stock, giving the stock large weights in their portfolios. Seeing as Public Storage (NYSE:PSA) has experienced falling interest from the entirety of the hedge funds we track, we can see that there was a specific group of funds that decided to sell off their entire stakes in the third quarter. It’s worth mentioning that Dmitry Balyasny’s Balyasny Asset Management cut the biggest investment of the “upper crust” of funds watched by Insider Monkey, worth about $40.9 million in stock. Richard Driehaus’s fund, Driehaus Capital, also dumped its stock, about $2.7 million worth. These moves are intriguing to say the least, as aggregate hedge fund interest dropped by 2 funds in the third quarter. Let’s now review hedge fund activity in other stocks – not necessarily in the same industry as Public Storage (NYSE:PSA) but similarly valued. We will take a look at American Electric Power Company, Inc. (NYSE:AEP), ServiceNow Inc (NYSE:NOW), Travelers Companies Inc (NYSE:TRV), and Anadarko Petroleum Corporation (NYSE:APC). This group of stocks’ market valuations match PSA’s market valuation. As you can see these stocks had an average of 43 hedge funds with bullish positions and the average amount invested in these stocks was $2040 million. That figure was $680 million in PSA’s case. ServiceNow Inc (NYSE:NOW) is the most popular stock in this table. On the other hand Travelers Companies Inc (NYSE:TRV) is the least popular one with only 26 bullish hedge fund positions. Compared to these stocks Public Storage (NYSE:PSA) is even less popular than TRV. Considering that hedge funds aren’t fond of this stock in relation to other companies analyzed in this article, it may be a good idea to analyze it in detail and understand why the smart money isn’t behind this stock. This isn’t necessarily bad news. Although it is possible that hedge funds may think the stock is overpriced and view the stock as a short candidate, they may not be very familiar with the bullish thesis. In either case more research is warranted.